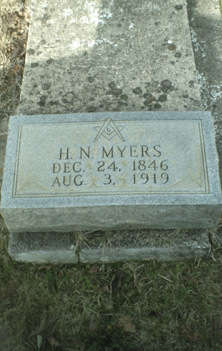 Howell Neal Myers was born on 24 Dec 1846 in Coosa Co, AL.. He enlisted in the military on 21 Mar 1864 in Decatur, AL. Joined as a Pvt. Union Army Co. G, 1st ALA.CAV. USA. Discharged 12 Jun. 1865 Camp Chase, OH. It was reported that Howell Neal drew a pension from the Union Army. He was buried in Aug 1919 in Pleasant Grove Cem. Walker Co, AL. He died on 3 Aug 1919 in Walker Co, AL.. He served in the military 1863 Confederate Forces in AL.. Howell hid out for a while to keep from joining the CSA. He deserted and went with his brother George, brother-in-law James Tindall, Caroll Cooner and Dave Wolf, and joined the Union Army. He was Methodist.